The Village Underground is a warehouse that is used for one off events. 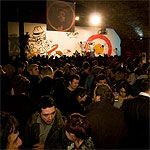 "Part creative community, part arts venue, Village Underground is a non-profit space for creativity and culture in the heart of East London. High above Great Eastern Street, atop the venue, four recycled Jubilee line train carriages and shipping containers make up the creative studios of Village Underground. These uniquely renovated spaces accommodate up to 50 artists, writers, designers, filmmakers, VJ's, and musicians working side-by-side in a creative community." Do you work at Village Underground? What did you think of Village Underground? Great post industrial interior, with low tech bar under old railway arches, but have a few drinks before you go. On the night we went, the only beer they had (speedily served ice cold by friendly staff though) was in incredibly small cans, so by the time you get to the stage area, you need to go back and get another one (maybe thats the idea) If they had got the choice of drinks right, they'd have got another two stars! On the plus side, the beer wasn't the usual generic brands (Carling or Grolsch) slopped out in most other London venues. Many thanks for taking the time to post a review. We have taken on your points raised and now have a number of beer options available at the bar. We're still working on the can size, but often the more interesting/low volume beers only come in smaller cans. Few London venues are able to make as impressive a first impression as Village Underground. Nestled between Great Eastern Street and Shoreditch High Street, the huge striking structure, crowned with four repurposed train carriages, plays host to a wide variety of events. Once inside, the rustic open brick and metalwork, cathedral-high ceilings and sheer vastness of the Victorian warehouse is visually impressive. Able to hold 720 people, the versatile interior combines a large dance floor (240 square metres), often illuminated with lasers or projections, with two smaller areas under the arches. In addition to its events, Village Underground is a self-proclaimed “ecological project”. During construction, the building made use of reclaimed railway sleepers, staircases, furniture and flooring in its design. Furthermore, way up on the roof, ex-shipping containers and the four tube carriages (trainspotters take note, apparently they’re ex-Jubilee line) are used as workshop or studio spaces. A diverse programme includes club nights, concerts, exhibitions, live theatre, social projects, and private functions. It tends to be busy with a boisterous and not necessarily discerning crowd. Village Underground has also been a go-to corporate spot for companies looking to find a London venue with impact. In 2012, pre-Olympics, Puma used the space for a Jamaican team photo shoot. Post-London 2012, Adidas hired out the venue for the Stone Roses to play to familiar faces including Jessica Ennis and Bradley Wiggins. The selection of live music and DJs on offer cover a range of genres. Past performers include stadium headliners Richie Hawtin and Sub Focus as well as artists outside the mainstream such as Baloji or Adrian Sherwood. When house and techno is played, the sound quality can be a letdown , with levels seemingly maxed out and the volume becoming abrasive and muddy. Earplugs at the ready! Bottles and cans of the usual boozy or soft variety drinks along with a standard supply of spirit and mixers are available from a small bar. Each drink will set you back somewhere in the £3 - £6 range. If looking for a massive and memorable venue in the Shoreditch area, Village Underground could be the spot.